ePUB (short for electronic publication) is an open eBook standard by the International Digital Publishing Forum (IDPF). eBook files in ePUB format have the .epub extension. Electronic publications are rapidly being converted from formats such as PDF to the ePUB format. 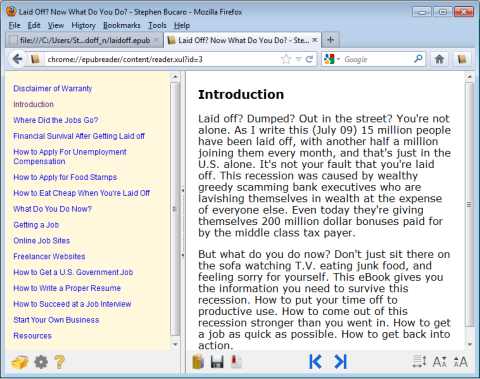 EPUBReader is a Firefox Plugin which lets you read ePub-files in the browser. You don't need to install additional software! In Firefox, browse to EPUBReader and click on the [Add to Firefox] button. At Google Books you can download over 1 million public domain eBooks in the EPUB format for free. To download a free eBook, just type the title of a public domain book in the search box, or click on the Browse books and magazines link near the search box. Then on the eBook's information page, move your mouse pointer over the red [EBOOK - FREE] button and, in the popup menu that appears, click on EPUB. You'll need to enter a captcha to download the eBook. At Project Gutenberg you can download over 39,000 free ePUB books. In the left-side menu, type the name of a public domain book in the search box, or click on the Browse Catalog link near the search box. When click on the title of a book you want, you'll be taken to a page where you can click the ePUB format to download. There are hundreds of other websites where you can purchase or download free eBooks in the ePUB format and read them in your Firefox browser with the EPUBReader plugin.